A fun "streetscape" activities onboard Royal Caribbean International's new Liberty of the Seas is the Pirate Parade in the Grand Promenade (basically the shopping mall area of the ship). The 20-minute parade is free for passengers to attend. Kids and adults alike will have a ball. 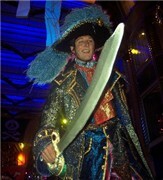 The pirate "invasion" features costumed entertainers, stilt walkers, pirate flags, pop-up floats, lively music, confetti, stilt walkers and more. Hey, are you a budding Apolo Anton Ohno, Laila Ali or Drew Lachey? If you want to dance like the stars, then head for a place to take lessons. Think that's at the dance club around the corner? Not necessarily. 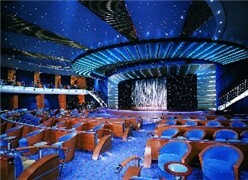 In fact, one of the best places to learn to swing, sway, rock and boogie is at sea! Yes, the recent tv reality craze and a rise in the popularity of dancing has led many cruise lines to integrate new dance programs and contests into their onboard entertainment line-ups. In fact, Princess even has a dance contest with winners "crowned" at the conclusion. So grab your dancing shoes... let's rhumba! 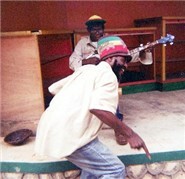 As our colorful Jamaican bus journeyed higher into that nation's interior, our group on a Carnival Cruise Lines' shore excursion "oohed" and "aahed" at the lush mountain scenery, sang along to Bob Marley's songs, and viewed the "real Jamaica" out the windows. Arriving in Nine Mile, we toured the Bob Marley birthplace and mausoleum and learned about the life and legacy of this Reggae icon ... Let's get together and feel alright. Regent Seven Seas has rolled out major new entertainment enhancements on Seven Seas Navigator and will add the new features to Seven Seas Mariner and Seven Seas Voyager late in the year. Guests will enjoy a new nine-piece Regent Signature Orchestra, five new production shows, new ballroom dancing lessons, and new late night cabaret entertainment.